All frogs are worth 1 point. Ponds all have frogs to catch! Frogs can either be male or female. Golden frogs (unisex) increase population regrowth. A population grows faster when a male and female are left in. A population grows faster when a male/female is already an adult. Capturing a frog reduces the population and thus the respawn rate. Time must be spent in-game (shutting off doesn't work) to respawn frogs. If Quina is not in the current party, frog-catching cannot be performed. After getting a certain number of captures, Quale will give Quina a prize. Outer Continent, in about the middle portion by choco tracks. Forgotten Continent, on the northern part of the peninsula. Lanar Island, southern sea, NW of Daguerreo (tear-shaped). Save before catching the ninety-ninth frog, though - you'll have to fight your master to obtain Quina's ultimate weapon. Here's how to prepare. First off, you'll want water-absorbant/-nullifying equipment: Ribbon works well here. You'll want to be able to remove the Mini status from your characters, so make sure you have Angel's Snack or someone with the Mini ability handy. Status effects are the main annoyance in this battle, so the abilities Clear Headed (confuseproof), Bright Eyes (darknessproof), and Loudmouth (silenceproof) will be useful. Quale has a few good things available for the stealing (such as the Robe Of Lords), so you may also want to have Master Thief set. This frogface has the most HP in the game, but unfortunately doesn't have a lot of MP to match it. Thus, using Magic Hammer over and over will make his reservoir deplenish pretty easily (in about 6 turns). If you've got a stiff-arm passive ability up for the status effects, this battle's far, far easier - those are his main method of attack. (Quale's Rolling Attack is not too shabby, though, and can probably do 2000+ to front-row fighters.) If his MP is drained, he won't be able to do any counters (i.e. counter physical attacks w/ Confuse) - and will get "No MP!" messages over and over when his turn comes up! Take this time to erect Mighty Guard and slam away, but only after stealing all that good equipment. I prefer an Amarant/Eiko/Quina/Zidane party, since Amarant can use powered-up Chakra attacks (if you have Power Up ability) to keep the MP supply going with ease and Eiko can use Might to power up any physical attacks or use Phoenix to revive everyone. 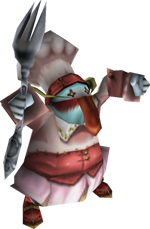 After defeating the master, Quale forks over (pun very intended) the ultimate weapon for Quina: a Gastro Fork!